Learn French in immersion and discover French speaking Switzerland. 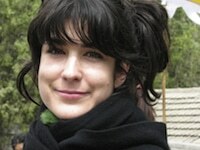 Raymonde will welcome you in the safety of her Swiss country home, share her daily life with you and teach you French. 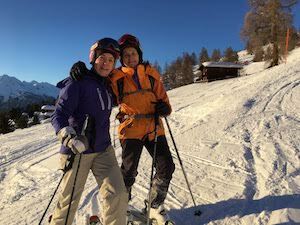 Fluent in French, English and German, she’s been teaching languages for 25 years, but now that her grown-up children have left the nest, she is eager to share her time with students and make them discover the relaxing Swiss way of life. My name is Raymonde and I have been living here for the last 24 years. I have 3 grown up sons: two live away and Vincent studies nearby and often comes back home. 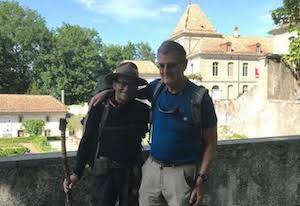 My partner Michel lives in Geneva. He will stay with us sometimes, and may also guide you to visit our gorgeous region. At a very young age I had a passion for languages, and was fascinated with people from other cultures. I lived in London for a year to learn English, then in Zurich to learn German, so I’m fluent in French, English and German. I started teaching languages 25 years ago, shortly after my first son was born, first setting up a clientele of friends, neighbours and expats. I then got my diploma in teaching French and started working in private language schools. Soon, I realised students best benefited from combining grammar with real life experiences, in a more relaxed environment. So I started offering immersion stays in my own home. I am excited to now join the French Today exclusive team of immersion stay teachers, and hope to welcome you soon for an immersion stay “chez moi”. My home is a spacious three-story house set in a calm and safe Swiss country village. Your room is large and comfortable. It was fully renovated in 2016. There is a queen size bed, a TV, a large choice of DVDs in French, access to wifi, a nice comfortable armchair to read, a kettle to make yourself a cup of tea (plenty of cookies to go with it ;-) and a little “bureau”. 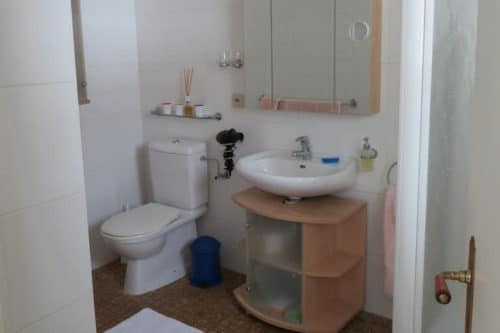 Your private bathroom is fully equipped with a shower, a toilet, and a sink. I love my house – I’ve been living here for 24 years, and raised my sons here. So many memories… I had time to think over the details and make it as comfortable as I like it to be. There is a large hearth/fireplace which really sets up a nice mood in the evening, as we crash on the sofas and read, chat or watch TV. One of my student’s favorite place to relax is the lounge chair in the living room… so cozy! 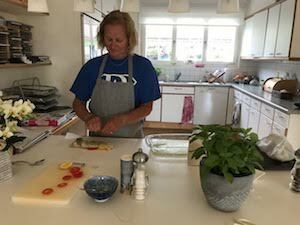 My kitchen is an important part of the house: it’s an open kitchen and my guests and students like to sit by the counter (and enjoy a glass of wine) as I cook. I like to entertain and often have friends and family over – you’ll meet them too! I love to cook and will happily adapt to any of your dietary requirement such as vegetarian or gluten free. I cook mostly with locally grown produce. 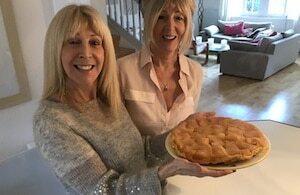 If you’d like, you can help me cook, and we can share some recipes: my speciality is “la Tarte Tatin” – who tries it never forgets it! 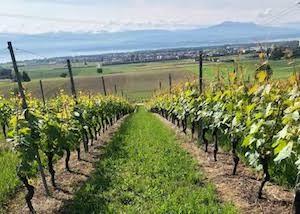 I am privileged to live in the area of “la Côte”, surrounded by the Lake Geneva (called “Lac Léman” in French), the Jura Mountains and the vineyards, not to mention the convenient access to Geneva and Lausanne (30min) and to Nyon (15min). Montreux is globally known for it’s yearly jazz festival, hotel schools, and once home of Freddy Mercury. A train can easily take you to the Rocher de Naye – mountain peak with 360 degrees view of the mountain ranges, the lake and the towns around it: breathtaking and well worth the small trip. Vevey is hometown of Nestlé and has recently opened a new museum of Charlie Chaplin. Morges, another town at the lakeside, with its colourful old town street and promenade, was once home to Audrey Hepburn, and attracts thousands of visitors every year to its impressive tulip park in spring. Jura is the top region for hiking, snowshoeing, cross country skiing – there is a little but very cozy ski resort nearby called St. Cergue. The region also offers a number of well marked cycling routes, especially enjoyable in the spring when the air is still brisk. And of course, there are many lake-side activities to enjoy in the summer. In the fall, the nature all around this area is just amazing – it’s the time of wine harvest and there are many wine related events. For historical site visits, one can explore the Nyon Castle, National Museum in the Castle of Prangins, the Castle of Chillon, the Castle of Coppet, the Castle of Morges, just to mention a few. 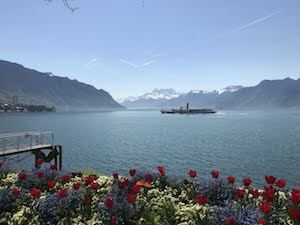 Lake Geneva, or Lac Léman, has daily cruises to France, where one can visit the medieval town of Yvoire and Evian with the publicly available Evian water spring, not to mention the SPA and a number of crêperies serving most delicious salty buckwheat crêpes. 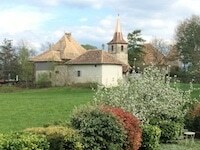 The town of Nyon is at a 35 min train ride from Geneva Airport. Then I’ll come and pick you up in my car! Once you are home, there are frequent public transportations to take you wherever you may want to go. If you prefer, you can rent a car, but you don’t have to. And I’ll be happy to lend you a bike it you wish to (I have a VTT and an electric bike). Please note that I don’t allow smoking inside my house. You can smoke in the garden if you wish to. I don’t have pets and unfortunately I cannot welcome them. Accommodation in your own en-suite room with a double bed, TV, shower, sink and toilet. Copious breakfast, generous lunch with local products (dinner can be arrange for an additional cost). The Price With These Options Is 1600 Euros Per Week For One Person. The bed in the student’s bedroom is a queen size, so it’s suitable for a couple. Depending whether my son Vincent is around or not, I may be able to accommodate more people. Just contact me and we’ll go over all the details and fees. My aim is to give you encouragement, support and help to gain an excellent understanding of the French language, allowing you to have the confidence to engage in conversation in the relaxed, peaceful, surroundings of my home. You will also experience the local delicacies, and explore the many beautiful scenic places of interest the region has to offer. All of this will give you yet another reason to come back ! Read Raymonde’s Bilingual French English Stories About her Region on French Today’s blog. What a wonderful experience! My summary: 5-star rating, far exceeded my expectations. I wish I had booked an immersion longer than one week and will absolutely come back to continue my French education! Raymonde teaches with such energy and passion that it is impossible not to feel inspired. She artfully blends motivation with empathy, critique with praise, and structure with spontaneity. She nudges you out of your comfort zone in a way that leaves you feeling supported, yet capable of managing similar French-speaking conversations later on your own. I felt from the very beginning that Raymonde could read me and my learning style. Right away, we went for a walk where she started to lift the dormant French out of me. Excellent teachers know how to quickly develop trust with a student, to help them overcome the fear of speaking a new language, and to encourage them to go for it, even when they don’t know all the words at the start of a thought or sentence. And this is exactly what Raymonde accomplished with me stating early on Day 1. Surprisingly to me, our morning “lessons” never really felt like lessons, in that I never felt a classroom pressure (or tedium), but rather felt that the structured learning time was a conversation in a low pressure setting for exploring vocabulary and grammar. This was the part of the experience that I worried would feel either frustrating or energy-draining, but neither was the case. Time flew by and I later looked back surprised at how much I learned and retained from these intensive morning lessons. In Raymonde’s immersion course, the learning process happens all the time, not just in the established lesson times. You are learning at breakfast, on walks, on a bike, at the market, around the house, on excursions, throughout daily life, etc. This is a priceless part of a well-designed immersion course. Toward the end of the week, I even started to dream in French, which to me is epic productivity! While this always-learning model can feel overwhelming at the beginning, it is such a differentiator from non-immersion learning. I remember around day 4 speaking a phrase I had heard in conversation, but never formally learned in a book or exercise. And with each day, this happened more and more. I love this style of learning, as it feels effortless! As my French improved during the week, we were able to speak on a wide range of meaningful life topics. This opened the learning process to not only language, but also to life experiences, culture, music, and philosophy, topics I greatly valued reflecting on and discussing. I would often get so caught up in an interesting conversation that I would forget that we were having it in French! Raymonde’s house is super comfortable, clean, well-designed, beautifully situated for sunlight, and full of positive energy. I slept very well and always felt at home. The meals were excellent, with her appreciation for quality evident. This was the best week of lunch dining I’ve had in years, perhaps ever! The setting is wonderful, from the charming village of Gingins to the view from the terrace. Beautiful nature starts right at the front door, but not far away at all, it becomes a stunning example of the best Switzerland has to offer. Views of the Alps, the Jura, Lake Geneva … the vineyards in Lausanne. It’s breathtaking — and I say this as someone who has lived in Switzerland for 12+ years. I was blown away every time we left the house for an excursion. For me, winter was the perfect time to visit. Not only did it suit my schedule, it’s also low season for tourists, so you feel like you have all the tourist attractions to yourself. It’s super calm, even at the major attractions, and this makes everything else feel calm, especially the part where you are speaking French MUCH MORE than you imagined! 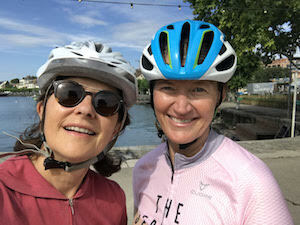 We had an excellent bike tour as one excursion and a stunning tour of the vineyard region of Lavaux as another. I would have loved both excursions even if they weren’t simultaneous language lessons. Combined with the language learning, these experiences were a huge treat! I studied French as a teenager in the US 30 years ago. We never really spoke the language though, so when it comes to speaking, I entered the course as a beginner. 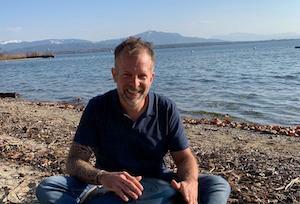 I live in the German-speaking part of Switzerland and wanted to learn French to teach yoga in French and to better connect with the French-speaking people in Switzerland and when traveling to France. I loved this experience and learned much more than I thought I would. Raymonde is an excellent teacher, offering a very special immersion learning experience. 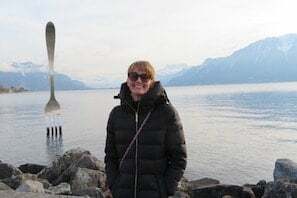 My stay in Switzerland with Raymonde was brilliant, I’ve really improved my french and learned a lot of new vocabulary and grammar, such as the difference in using connaître and savoir. Every morning was productive and we would use websites to practice grammar and learn about various different things such as the Red Cross and it’s history. After completing work in the morning, we would do an activity which would always be interesting and fun, such as walking with les raquettes in the snow, a cinema trip, and meeting an former member of the Red Cross and finding out about his past stories. I always felt very comfortable around everyone here, and I felt very welcomed into the house. The bedroom and bathroom was very spacious and comfortable to stay in, and the food was fantastic. Therefore it is an experience I would recommend to anyone learning french or wanting an immersion in the language and culture, as it is a fun and exciting experience, and I have also really improved my French. This past January I went to Switzerland for my very first time. After spending only one week with Raymonde, I am already planning my next trip out there. Her patient, yet persistent teaching style, the activities she planned and the gorgeous setting made this a truly remarkable week! I was a little nervous getting to Nyon from Zurich as a solo traveler, but the trains were so much easier than I had imagined. Plus, it helped that Raymonde was there to meet me at that last stop with a big hug and a huge smile. I was immediately welcomed into her home with such warmth. I had a large, lovely bedroom and bathroom all to myself and felt comfortable the moment I walked in her front door. Each morning she had tea and a light breakfast ready (I don’t eat much in the mornings) and we would sit and talk about the previous day, the current days’ activities and pleasant ‘get to know each other’ conversations. That alone was really great practice for me, but that was just the beginning! There would be about three hours of sit-down instruction that would follow during each day. As the low intermediate student that I am, she was immediately able to pick up on the grammar issues I was struggling with so we focused primarily on those. There were workbook exercises, listening comprehension activities and a little homework for me to complete on my own. I also told her I wanted to become more comfortable shopping and eating at restaurants so she included various role-playing exercises so I could practice those situations. Over the course of the week, in addition to the more formal instruction, there were various excursions that I participated in. I accompanied her to a grocery store (where she used that time to teach me more vocabulary) and we went on a long walk through her beautiful village where I was able to continue practicing my conversational French. 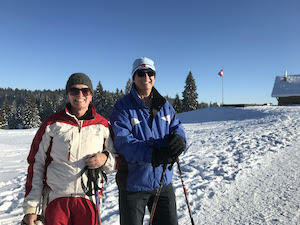 We spent one afternoon snow-shoeing in the breathtaking Jura Mountains to a quaint (and super delicious) chalet. 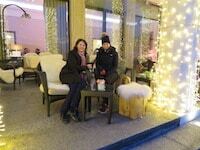 There, Raymonde introduced me to some amazing fondue and vin chaud. We also spent an afternoon driving along the coast of Lake Geneva through the gorgeous vineyards and stopping at various towns for some lunch and shopping along the way. Every activity we did was an opportunity for me to practice, practice, practice! 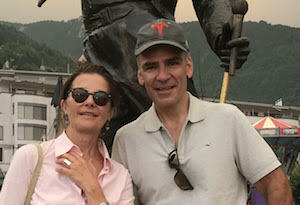 Prior to this trip to Switzerland, I had never participated in a teaching program like this. I attended one language immersion school in France for two weeks in 2016. While I definitely improved my French during my time there, it was a much more formal setting with the classrooms and marker boards and the ten minute breaks between classes. I left with improved French, but I was disappointed I hadn’t been able to experience the life and the culture of that city. My week in Nyon, however, was such a different experience from that. I had the opportunity to see and experience so much! 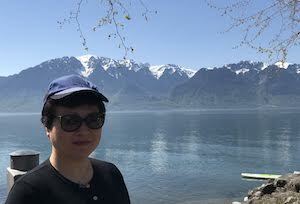 I returned home feeling like I really had the opportunity to explore that remarkable area of Lake Geneva all while practicing *and* improving my French. I had such a marvellous time with Raymonde that I plan on returning in 2020. See you soon, Raymonde! My Husband Martyn and I spent a week with Raymonde and her Family in January this year. I have been learning French for the past few years in Sydney, and I was keen to improve my confidence and fluency during a French immersion. 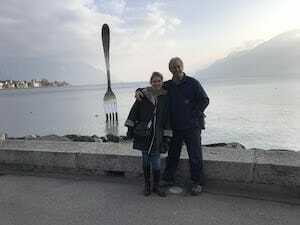 My husband was happy to come to Switzerland with me but he doesn’t speak French. Our holiday experience with Raymonde was perfect. She is a great teacher and a warm beautiful person, with a great sense of humour. 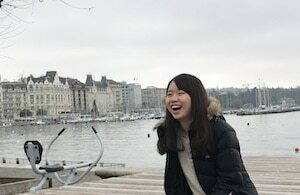 We both felt very comfortable in her company, and we really enjoyed getting to know her and about her life in Switzerland. Our lessons together were very relaxed and included role play, listening and comprehension, grammar and lots of conversation on all sorts of topics. We had walks together, on one we walked to a nearby farm to buy eggs and locally made Walnut Oil. 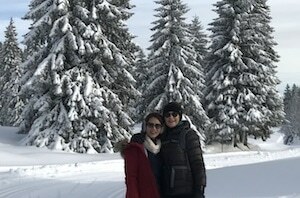 On another day we went to the local Jura Mountains and we snow shoed 5.5km to a restaurant in the forest, for a Fondue lunch. 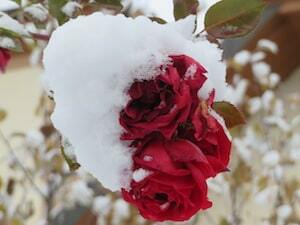 It was a beautiful cold day with blue sky and deep snow, it was a very memorable experience. Raymonde lives in a beautiful part of the world, close by to many interesting places. 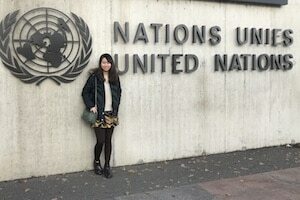 We had hired a car and we visited Lausanne, Vervey and Geneva. I think without a car, public transport is very easy and convenient. We were very confortable and warm at Raymonde’s home. We had a large bedroom with ensuite bathroom. Raymonde is a great cook with an interest in nutrition, so we had very healthy and nutritious meals, and I learnt a few new recipes. 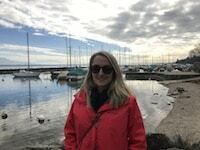 I came away from my immersion in Switzerland thinking it was a great holiday experience for both my husband and I.
I feel I have achieved my goal of improving my french conversation fluency, and my confidence when speaking French. I decided to get some extra help with my French as I thought it was not up to scratch. I am studying French for A-level/Pre-U and Raymonde accommodated my student level. Staying a week with Raymonde was the best choice possible for me to improve French and gain in confidence in speaking and listening. These were my main aims on the course and Raymonde tailored and adapted the experience to suit my aims. Raymonde and her partner Michel, and her son Julien were all very welcoming and made me feel at home instantly. There were lessons in the morning in which we worked on newspaper articles, grammar and listening exercises. They were very helpful in aiding my comprehension as the week progressed. We went on excursions to Geneva, Lausanne and the Jura mountains. We saw the festival ‘ L’escalade ’ on the day I arrived. People dressed up in costumes and there was a parade of different guilds with animals and music. It was so much fun! 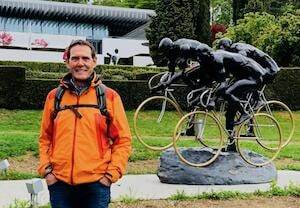 I visited the Olympic Museum in Lausanne which is exceptionally well presented and informative. We went on a lovely walk in the snow to a Chalet where I had my first fondue. It was a spectacular way to round off the trip. The town of Nyon is only a twenty-minute bus ride away and includes attractions such as a castle, a roman museum and a wonderful and modern swimming pool (padlocks are obligatory). Raymonde conversed with me about a whole range of topics, some extended from the lessons in the morning, others involving specific scenarios, culture, and history. She is as good a host as she is a teacher, with excellent meals, a great sense of humour and incredible patience. This stay with Raymonde is really the best of both worlds. Being fully immersed in French is great for learning and the excursions and relaxed atmosphere make it a holiday as well. It truly was a marvelous experience all around and I will return home feeling much more confident and having learnt a great deal with Raymonde. I would wholeheartedly recommend Raymonde as a terrific host and an inspirational teacher. I hope I get the opportunity to return. 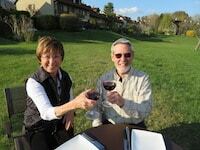 My husband and I recently spent a wonderful week with Raymonde in Gingins, Switzerland. My goal was to improve my oral comprehension and conversational skills and this immersion program definitely met my expectations. Raymonde and her partner Michel are extremely warm and welcoming people. My husband and I immediately felt at ease in their lovely home. Our accommodations were very comfortable and the meals were delicious! A typical day for me included a morning walk and conversation with Raymonde followed by a couple of hours of lessons. My husband, who was not taking lessons, enjoyed long walks and a chance to catch up on his reading. In the afternoons we explored the area. Although it was not necessary, as there is transportation in the area, we did rent a car so it was easy to explore on our own. We visited a chateau in Prangins, some local museums, a chateau and Roman ruins in Nyon and took a boat trip on Lac Leman to the quaint village of Yvoire, France. The highlight of our week was a full-day excursion with Raymonde to Gruyère that included stops on the way in the lovely villages of Lutry, Puidoux and Chexbres which are situated in the wonderful area of « Le Lavaux ». I can’t say enough good things about Raymonde as a teacher and host. She is a very interesting and open person who made conversations natural and easy. She considered my goals and assessed my needs. Learning was challenging and fun and I learned some new methods for improving my oral comprehension that I hope to continue to use with my French teacher at home. My only regret is that I would like to have stayed longer. Thank you, Raymonde for an exceptional experience! 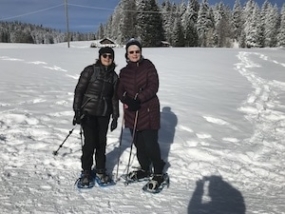 As a result of my experience during my week-long immersion with Raymonde in Switzerland, it is more than likely that I will return again in the new year. Having not studied any French in 25 years prior to my visit, I had also realized that my High School level of French was not quite of the standard that I had thought it was at the time! It meant I arrived with a very basic foundation but little more. I have to say what made this experience so pleasurable for me (as one who was not particularly looking forward to the week), was Raymonde herself. She is an absolutely amazing person to spend time with. She is so open and welcoming, with a great sense of humour, and she lives life with a joie de vivre in everything she does. On top of that she is an incredibly astute teacher with the ability to make learning easy and fun. Personally to come away from a week-long immersion and to be thinking of timing for my next visit, is far beyond the expectations I had a little over a week ago! It can be frustrating and daunting as an adult to be faced with scenarios where you don’t understand or can’t express yourself. Raymonde’s home was a zero judgment environment, and she herself is a joy to spend time with. Her willingness to open up about her own life’s experiences opens the door to personal conversations, and therefore the natural conversation and the learning as a result, are a part of everyday life, rather than the sort of school situations taught under other learning formats. The location for the week is perfect, as the Lake and its surrounds are breathtaking. There is plenty of opportunities to take in the beauty of the area during the course of each day, and the excursions on offer provide further opportunities for learning about the history of the area, with the benefit of Raymonde’s extensive knowledge of her homeland. The Swiss truly have a great lifestyle and there is every chance to partake in that throughout the week. On top of that, whenever any other members of Raymonde’s family or extended family were around, they too ensured that I felt welcomed in their home at all times. I am delighted I chose Raymonde for my immersion and I would have no hesitation in highly recommending her to anyone who is considering a week’s long immersion. Raymonde is both a dedicated teacher and a delightful person to get to know. I felt very welcome in her home and enjoyed participating in meal preparation and conversation with her family. The Swiss accent is wonderful for the comprehension of early intermediate French learners! My capacity to follow a conversation definitely improved over the week and Raymonde was very helpful in identifying some misconceptions/habits that I needed to address in my verbal expression in order to progress. While challenging at the time, I have been able to concentrate on these areas during my independent study time, supported by Raymonde’s advice and additional excellent resources that directly target these skills. Our excursion day was great fun and introduced us to some out of the way places that we would never have found as tourists. My husband also enjoyed the week, even though he wasn’t participating in the French lessons, as Raymonde’s family is very inclusive. I hope to return at some stage in the future and continue my French learning adventure. The immersion experience is so much better than simply being a tourist in a country. 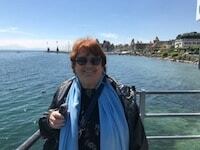 The week I spent in Switzerland with Raymonde was the highlight of my 3 weeks in Switzerland and France! 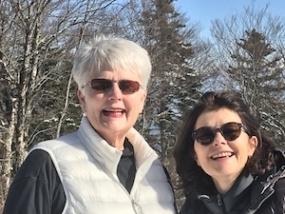 My week with Raymonde was a very valuable experience for me since I’m not one to readily engage in conversations in French – but with Raymonde, I had no choice, and it was great. At the end of the week I felt more confident in my ability to communicate in French thanks to Raymonde’s thoughtful careful guidance. I am learning French for work and spending the week with Raymond really helped me advance my French. I enjoyed having dinner with Raymonde and her friends and family, I even joined her for towns local celebrations for the Swiss National Day and we went a nature walk for our excursion. The evenings were my own and it’s really easy using the bus to get to Nyon and beyond. With my evenings I took excursions to Nyon, Geneva, and Yvoire in France. I loved my week there, Gingins is a beautiful town, and I really developed my French, I’m sure I’ll be back again! I spent a week with Raymonde and I have to say it’s not easy for me to write this review in English because French words keep popping up in my head! Raymonde is a terrific teacher who quickly understands what the student needs and interests are and she tailors her classes to work for the student, for me it was more conversational rather than textbook and it was all so relaxed I never felt I was studying…parfait! Raymonde is a very generous lady with a larger than life spirit and we had such a great time when we went out, I hardly felt like I had ‘planned excursions’ it was like going out with a friend (while struggling to get my French tenses right) and then voila the next day depending on the mistakes I made the previous day, there was an exercise to practice! She makes a lot of effort to find ways to integrate you into daily life. From shopping at the local supermarket to inviting me to her sons birthday dinner and its a big plus that her whole family is as kind and warm. It’s a great way to gain the confidence to speak in French. I enjoyed my long conversations with her on travels, life, music and everything in between. I hardly know where to start in describing what a wonderful experience I had with Raymonde. I felt at ease with her from the moment we met at the train station. 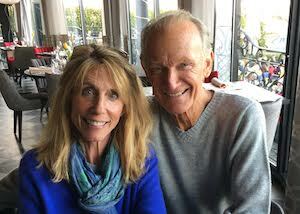 By the end of the first meal we enjoyed together on her patio, I felt we were on the road to a lasting friendship. It was clear immediately that she truly loves what she does and is a people person in every sense of the term. She has a wonderful spirit and we shared many stories and laughs together throughout the week. I enjoyed our morning walks in the beautiful countryside, during which we discussed a wide range of interesting topics. 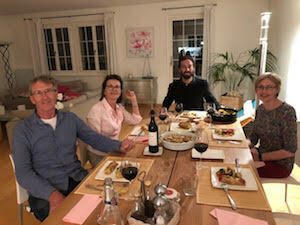 Raymonde and her partner Michel graciously included me in a dinner with their new neighbors and I was pleased that I could both follow and participate in the conversation. This was also an occasion for me to observe firsthand how people getting together for the first time socially settle the question of tutoiement/vouvoiement. This is always a challenge for us anglophones to understand! Raymonde’s son Julien was equally welcoming and often contributed useful insights when Raymonde and I were discussing various questions of French. As a teacher, Raymonde is very knowledgeable, patient and supportive. Her explanations of various points and responses to my questions were very clear and helpful. I particularly enjoyed learning some of the nuances between “Parisian” and Swiss French. Nyon and the surrounding area are astoundingly beautiful, and I feel like I only scratched the surface of what there is to see. 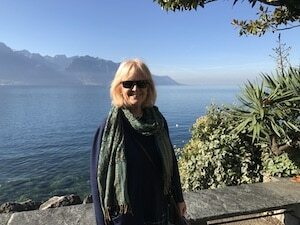 We enjoyed visits to Vevey, including the excellent Charlie Chaplin museum, Montreux, and the nearby vineyards where we enjoyed lunch in a restaurant overlooking the lake. 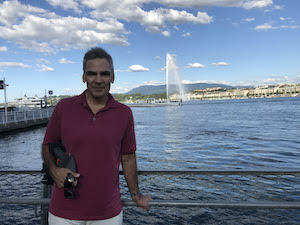 We spent a wonderful last day in Geneva, where we strolled through the park and the old city before enjoying dinner together in an excellent restaurant. We topped off the day by meeting Raymonde’s friend to take in a movie at the free open-air cinema. I’ve been living in France for a few years but I have been frustrated at the level of my conversation and comprehension. I felt I had a good grasp of grammar and my writing was adequate. I decided a week living with a French family with daily lessons might improve the flow of my conversation. Raymonde immediately welcomed me into her home and the room in her house is large and comfortable with a big bathroom. A very nice area to spend some down time. From the moment I met Raymonde we were speaking French and the conversation flowed even while Raymonde was making small corrections. As we talked about my sporting interests of biking and hiking, a plan started to form about how we might mix the study with outdoor activities. Our first morning was spent walking around the local area then several hours of grammar before lunch. 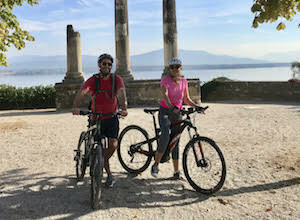 The weather was lovely and the following morning we set off for a bike ride to Nyon. It was a stunning ride through the countryside on quiet back roads past vineyards and small villages. 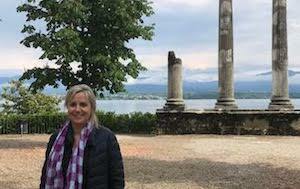 After arriving in Nyon we visited the Chateau and the Roman columns. We headed down to the lake and found a little fishing village where the fishermen had just returned with a fresh catch. We decided to buy some fresh fish for lunch and then stopped for a coffee looking across the sparkling Lake Geneva to France. 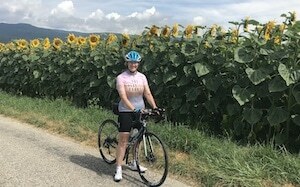 We returned to Raymonde’s home via fields of beautiful sunflowers. As we rode around, Raymonde helped me expand my vocabulary and corrected my grammar and tenses. This was one of two bike riding excursions during the week – the other was to Divonne just across the border in France. 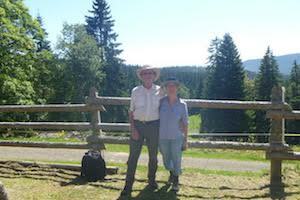 We also did another beautiful hike into the bottom of the Jura Mountains. Study time included watching television programs and listening to audio stories on topics I was interested in and then discussing the content. We also fine-tuned some grammar issues that I had been struggling with. Spending the week with Raymonde and her partner Michel and son Julien was excellent for my French. The flow of my conversation had improved and both Michel and Julien were also very patient and helpful in correcting any mistakes I made. I feel I have made a new friend after meeting Raymonde and I hope to see her again soon. I am incredibly grateful for the week spent with Raymonde, her partner Michel and her son, Julien. Not only do I feel my French has drastically improved, but my understanding of the history and culture of Switzerland has been expanded. Our days together began with breakfast from which our lessons started immediately after and ended just before lunch. While Raymonde focused our courses on the fundamentals of the language that she identified would help me, discussion arose organically that branched into a number of topics that tested and refined my French conversation skills. Afternoons were free where I could use a motorized VTT—a first for me—for scenic yet strenuous rides in the Jura mountains. I also had the bus at hand to take me to centre ville Nyon for shopping & site seeing. Part of the curriculum were two excursions that we finalized together based on my preferences. 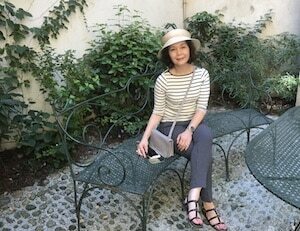 The first was visiting the historic chateau Prangin where I read the panels and listened to the recordings in French. Our second excursion involved touring the UNESCO recognized region of le Lavaux, the chic coast of Montreux and exploring Guyere with its chateau and museums. For anyone looking for an organized and magical experience to build their confidence and skills in French, I would highly recommend Raymonde and her comprehensive experience, structured approach and generous spirit. Each year for the past four years, I have traveled to France to study French and to work on my oral comprehension and speaking ability. I choose a new region of France each year so I can explore the rich history and culture of the country, while trying to learn the language. Normally I choose a school that specializes in teaching French as a second language to adults, but have not been satisfied with my progress in a group classroom situation. It’s been my experience that you really don’t get to speak a lot of French in a classroom situation. 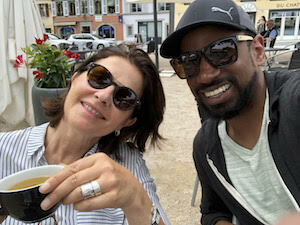 After having discovered the immersion programs offered thru FrenchToday, I decided to try a one on one customized approach, and was fortunate enough to spend a week with Raymonde in the beautiful village of Gingin in the French speaking region of Switzerland, very close to Geneva. At first I was a bit concerned about going to Switzerland to practice my French. But, much to my surprise, western Switzerland is the perfect place to learn and practice your French. Particularly if you have Raymonde as your professor! Unlike most regions of France, I found that the people I encountered in Switzerland spoke French very clearly, and at a reasonable pace which made understanding much easier. My correspondence with Raymonde, in advance of my arrival, outlined my interest in practicing my French in everyday situations, versus spending too much time in a ‘classroom’ environment. The day of my arrival at Raymonde’s beautiful country home, we chatted in French about all the types of things that one does when you first meet someone. 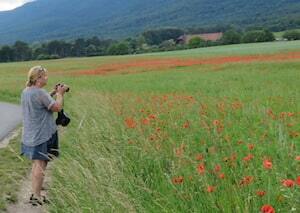 We took a walk in the country, in the foothills of Le Jura, and just spoke French. Raymonde made me feel totally at ease and comfortable from day one. What I didn’t realize was that Raymonde was analyzing my French language skills, and had identified a number of specific issues that I needed to work on. The issues identified that first day, became the foundation of the morning workshops for the rest of the week. When we weren’t in the morning ‘workshops’, we were doing everyday things like grocery shopping, running local errands, and taking walks in the beautiful countryside near Raymonde’s home, all in French of course. 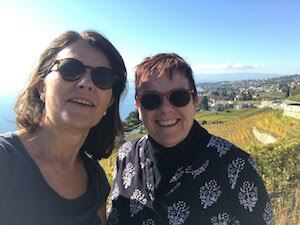 There were walking tours of Gingin and Nyon, and an incredible drive thru Lavaux and the ‘Vignoble en terrasses’ perched high above Lac Léman, where I had to learn a new word to describe the absolute beauty of the area – époustouflant! On my free afternoons, I explored the region around the lake. 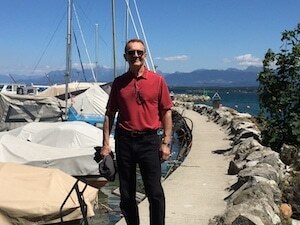 I crossed Lac Léman by boat to tour the picturesque village of Yvoire (France), and drove to Lausanne and took a walking tour of the old city with a guide (in French of course). My week with Raymonde was a fantastic way to study and practice French in everyday situations, exactly as I had hoped it would be. 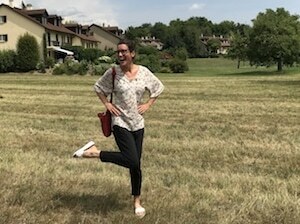 I have returned home after a 3-week vacation in France and Switzerland, including a wonderful week spent practicing French with Raymonde and her partner Michel in the beautiful village of Gingins in rural Switzerland. ???????????? The next morning was a nice breakfast followed by the daily study time, each session including listening to and reading from the French periodical “Bien-Dire” as well as some review of grammar. Later that morning Raymonde took me on a walking tour of idyllic Gingins. 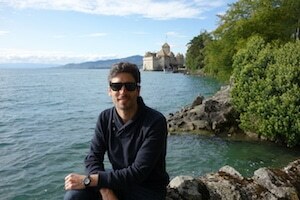 That afternoon I crossed Lac Léman by boat to tour the picturesque village of Yvoire (France). The next day was spent following the beautiful Route du Vignoble with its breathtaking views of villages and vineyards perched above the lake. We also visited a farmer raising goats for making cheese, and later that day the Arboretum – a forest preserve conceived to compensate for the loss of many trees during construction of a nearby highway. We were allowed entrance to the (closed) Arboretum museum thanks to the gracious museum curator. Subsequent days were spent with morning breakfast and studying followed by various excursions including a stop at a local boulangerie, as well as visits to Nyon and Château Prangins. As the week progressed I was feeling more and more at ease conversing with Raymonde. Michel, and others in French, thanks to Raymonde’s patience and guidance. All in all, my week with Raymonde and Michel was a fantastic way to study and practice French, but it was actually that and much more – an immersion experience of language, culture, and getting to know some wonderful people that I now consider friends. As others have noted, Raymonde is a great cook. We found out that we have similar music tastes, so we shared numerous music videos. She also introduced me to Option Musique, a Lausanne-based radio station which I now listen to at home via streaming audio. In summary, an unforgettable week! Hoping to return next year if everything works out … ???????????????? My week with Raymonde was excellent. She greeted me at the train and quickly worked to make me feel at ease, which was not an easy task. We stopped in at the birthday party of a close friend and I was able to talk a bit with some others. Then we went to a dance festival in a village close to Gingins. The next morning was a bit difficult for a person who doesn’t like to talk in the morning, even in English, and who was definitely suffering from jet lag. She was just as warm and friendly at breakfast as she had been the night before and she had me speaking more as the morning wore on. Our daily walks were excellent for me to relax and begin to make progress. Studying at the dining room table was awesome after she got me to laugh and breathe. I really enjoyed reading and comprehension, although difficult at times, and was sorry that the time passed so quickly. Cooking with Raymonde was another great experience. She is an excellent cook and great instructor in this area also. I learned to make and taste things that I had never experienced before. Our adventure to Geneva was great, walking through the streets and seeing the old and new buildings, stores, churches and waterfront. I also thoroughly enjoyed the Olympic Museum. While these excursions were great, my main focus was to gain confidence speaking and understanding French. I quickly realized that 1 week is not really enough to progress to a level that I would be happy with. She made me work hard during class, understanding that was what I wanted. She focused on my weak areas and did exercises to help strengthen them. I truly enjoyed the week and would have loved to stay longer or come back again. I have have previous experiences with French immersion and this was by far the best. I had a wonderful week with Raymonde. She is an exceptionally generous host with a talent for engaging with people, as well as highly intelligent and a patient, experienced teacher. Her house is lovely and I felt very much at home. Raymonde’s joie de vivre is infectious which adds to the positive ambience of the experience. Also, Raymonde is an exceptional cook who catered to my specific dietary requirements with ease . She showed me some lovely sights around the area as we talked together and I increased my confidence in my comprehension and speaking. It was definitely a far step out of my comfort zone to do a French immersion for a full week after only having taken French lessons sporadically at home for two years. I had not studied French when I was young so trying to learn a new language in my sixties is certainly a challenge. To put it plainly, I was excited but also a bit afraid. Even before my visit Raymonde took the time to learn about me personally, what I liked to do, what I liked to eat and what my objectives were for the week. Then, on the morning after I arrived, we took an amazing walk through the countryside near her home. We spoke sometimes in French and sometimes in English, all the while she was assessing my level of competence so she could customize the week for me. Because of this she hit the right target. For the whole week I was always challenged but never so much so that I became discouraged. It was “parfait”! Her house is neat and clean. Your private room and bath are as nice as a hotel. She is an amazing cook and each day I was treated to visual and gastronomic delights. Because Raymonde had taken the time to know who I was, she had planned both meals and excursions that suited my taste. The most extraordinary trip was a visit to the Olympic Museum in Lausanne because of my interested in sport. 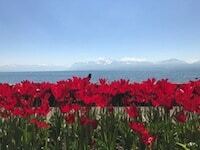 We spent the better part of a day there and had the most delightful lunch overlooking the Lac Leman. Each day was a new adventure so that the process of learning was woven into the very fabric of life in French speaking Switzerland. The two french expressions, which Raymonde would use frequently and became the theme of my week, “Mon Dieu” and “J’adore”. Both summed up, not only the wonder, but the delight of a week well spent with a new friend. I have forever been changed by the experience and hope to make another journey there sometime soon. My week with Raymonde and her family so far exceeded my expectations that I nearly cried when I had to say goodbye to this amazing woman who was “ma Professeure” but now I call one of my dearest friend. 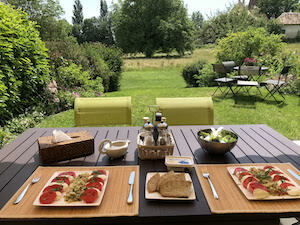 An immersion at Raymonde’s house is not only a great way to improve your French but so much more…….a time to relax and breathe fresh mountain air, to meet new people and to make friends, to immerse yourself in the Swiss/French culture and to experience the art of simple and healthy cooking. I was welcomed by Raymonde and her partner, Michel, and immediately felt at ease. 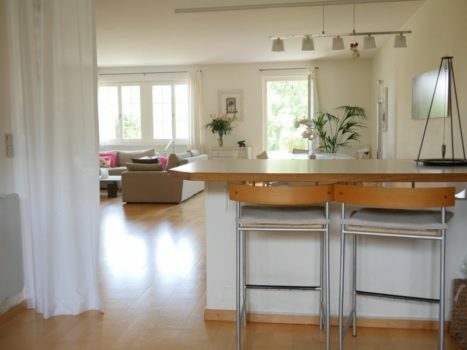 The comfortable house is nestled in a small village near Nyon, a quick and easy train journey from Geneva. My room was bright and welcoming with plenty of space and all the facilities one would need. After settling in, I enjoyed a healthy supper served on the terrace with a glass of wine and convivial chatter. Any apprehension I had about the week were quickly dismissed from my mind! It was apparent from the start that Raymonde tailors the week to your specific needs and wishes. We agreed that a morning stroll in the countryside whilst practising conversational French was a good way to start each day. And so our week together began…. Breakfast was always chatty and the walks were delightful in the warm sunshine and provided a relaxed environment to practice speaking. Raymonde’s patience was unending in correcting my continuous errors and we soon found we had much in common and much to talk (and laugh!) about. More formal teaching followed but the topics were driven by my own needs and a variety of methods were used to make this time fun and interactive. The morning concluded with a wonderful lunch prepared by Raymonde, again tailored to my own preferences. The presentation of the food was outstanding and the food delicious and healthy. The afternoons and evenings were spent exploring the local area; sometimes accompanied by Raymonde and sometimes alone. I found the transport easy and efficient and felt very safe travelling alone. 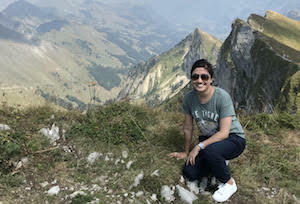 I visited many places including a trip to France (just across the lake at Yvoire), and enjoyed different activities but it is hard to write about the highlights as I really enjoyed everything! Perhaps a special mention should go to the evening we spent with two of Raymonde’s adorable friends in a small nearby village called Ginvins, experiencing the local “soirée annuelle”. This consisted of the Men’s choir of Avenir followed by a theatrical group production of a comedy “Le Club des Poulettes”. Even with my limited French, I was able to participate in the frivolity of this piece and really enjoyed being part of local life. I cannot finish without a mention of the tulip festival at Morgues. The colours and displays were truly magnificent against the backdrop of the lake and the Alps. “Il est où le Bonheur, il est où? 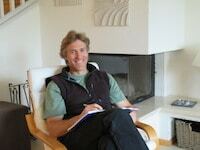 My husband and I had a wonderful immersion experience in Raymonde’s lovely home in April. The lessons were instructive, level appropriate and always fun. We laughed and learned while cooking, dining and taking excursions throughout the extraordinary Swiss countryside. Raymonde is an excellent and patient teacher, elegant hostess and terrific chef and someone who truly understands and enjoys people. Though my husband and I are at different levels she was able to provide us with private lessons precisely tailored to meet our goals, interests and learning styles. Raymonde’s attention to not only our immersion experience but our personal comfort and needs created a truly memorable and fulfilling ‘sejour’. She was very generous in sharing her family and friends as part of our stay and we truly felt part of the community ! First, it is easy to come to Raymonde, it takes only 25 mins by train from Geneva Airport to Nyon. Second, Raymonde welcomes you and makes you immediately feel at home. She took me around, to see the scenery, to go jogging and she brought me to the very picturestique places like Vevey, Montreux. I breathed the very fresh air unique to Switzerland and I felt the warmth of the people, of the country. Third, Raymonde is a teacher of high calibre, she puts in her wide experience, the expertise, the technique, the patience and the passion. She virtually tailor made the week according to your level and lifted you to another one. The way she teaches is simple, clear and focused. Every morning after the lessons, I felt confident, happy and interested to learn more and practise speaking French with her during the whole day. In fact, I think I had spoken more French this week than in the past one year under the encouragement and guidance of her. Last but not the least, Raymonde is a good cook and also a very generous host. She provides all the very fresh and seasonal fruits, vegetables, meat and fish as you like. Every meal is having good quality food together with good quality discussions and sharings. 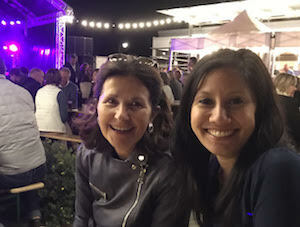 It was really a unique experience and very worthy to come to Switzerland, to have the French immersion with Raymonde. I look forward to coming again soon when possible. Raymonde, je te remercie encore une fois et à bientôt ! After almost 40 years of hibernating French skills from school, the two of us were eager to resume and develop our communication skills. As we are nature and outdoor guides for an European market we would love to be able to communicate a bit in French. The choice of venue and teacher couldn’t have been better. From the very beginning we felt warmly welcomed in Raymonde’s home and life. With generosity she shared friends and family to give us as many opportunities as possible to get into the culture and language. Food was excellent and carefully chosen to suit what we liked. 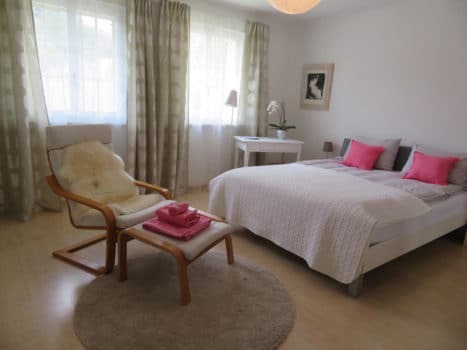 Her home is situated in a nice little village with wonderful surroundings and views in all directions – Jura mountains, The Alpes with Mont Blanc and Lac Leman. A perfect starting point for all kind of excursions. Raymonde was very responsive for our desires/requests and guided us in different environments. When we were on our own she gave us a lot of suggestions of interesting activities. We can’t choose a highlight but listed are most of what we experienced. Many walks in the environment, walk in Nyon, visit in chocolaterie, photo exhibition, car/train trip to Gruyère medieval town and cheese production, bike tour together to Divonne market in France, Jura mountains with a tiny bit of skiing, vignobles, Arboretum. All these experiences we documented with photos and together with Raymonde we wrote a travel story in French. It was possible to find the hidden language inside the brain. Thanks a lot Raymonde! I admit to butterflies in my stomach the first night of my French Immersion Experience. What had I gotten myself into? The family was conversing rapidly in French. I was understanding one word in ten! But soon Raymonde put me at ease with her kind and reassuring manner. I joined the family for a birthday celebration. It was a terrific way to start this adventure. My attempt to learn French started after I retired. I had been taking courses for two years, but felt that I wasn’t keeping up with the rest of the class. Having a one-on-one instructor would be perfect for me. I became a challenge to Raymonde. My pronunciation was poor and my ability to understand the spoken word was quite limited. Raymonde was quite patient plus inventive with me. Her relaxed teaching approach and ability to change teaching approaches facilitated my learning curve. I was pleased to know that by the end my pronunciation had improved plus my understanding of the spoken word had increased. I decided to write a story of each day’s activities. It forced me to utilize that day’s tools plus increase my vocabulary The following morning Raymonde would review with me the grammar and sentence construction. I feel that this activity applying what I had learned was invaluable. I felt very at home in Raymonde’s house. I enjoyed having my own room to retreat. I looked forward to each breakfast and lunch. Raymonde loved to cook. I loved all that she made. In fact I learned a number of new dishes that I intend to try. Raymonde also tried to make meals with foods I preferred, which was appreciated. Our activities were varied. We walked, snowshoed in the Jura mountains, ate a meal in local restaurant, and shopped at the markets. Shopping at the markets and eating in the local restaurant gave me another opportunity to apply what I had been learning: how to ask for an item plus how to pay. My favorite part was the shopping in the grocery store. I love looking at the different foods in a grocery store, no matter the country I am in. I think the type of foods, the arrangement of the store and the packaging reflects the culture of the country’s inhabitants. My friends asked would I do this French Immersion again. I have responded without hesitation, Yes! It was a great experience with a terrific person. I have nothing but praise for Raymonde; her comfortable home, her teaching abilities, her cooking and her interest in my progress. Most of all, I loved the collegiality. This was a priceless experience which we’ll never forget and would highly recommend to anyone looking for an immersive introduction into Swiss-French culture and savoir-vivre! Just as everyone else here says, Raymonde is a fantastic hostess, brilliant chef, patient teacher and a truly lovely person. 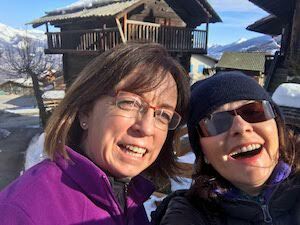 We spent a week immersion in January at only A2 beginner level French and over the week Raymonde built up our vocabulary, confidence in listening, reading, comprehending and speaking basic conversational French very well! 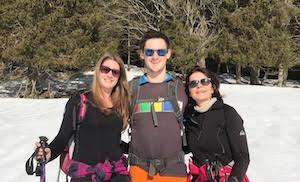 We visited Lausanne, Geneva, local museums and went snow-shoeing in the mountains on a beautiful day, fully earning a delicious fondue lunch! Her home is clean, beautifully presented and very welcoming so we really felt comfortable and at home the whole time. It was great chatting with her, her partner Michel and son Julien, enjoying Swiss hospitality, sharing stories and laughing together. Thanks so much! We cannot have wished for anything more and look forward to returning to see the delights of the region in the summer time! What can I say that hasn’t already been said after a week of French immersion with Raymonde in Switzerland? No two days were the same. All however, were filled with conversation, activities, laughter and learning. There is no magic potion to learning a language however Raymonde’s formula for tuition has to come close. She is a teacher who can quickly determine your learning style and adapt her own instruction to suit. We did a variety of activities, chosen to suit my interests but also perfect for increasing my vocabulary and improving my confidence in participating in everyday conversations. Raymonde has a zest for life that is contagious and you immediately feel welcome and at home amongst her family and friends. Such a wonderful opportunity to take your conversation skills to the next level while enjoying the Swiss way of life. You may even have the chance to snowshoe or ski in the mountains nearby! So many times I have thought about our wonderful week at your house! I loved the pace and your gentle efforts to instil confidence in me. I now can fearlessly can charge into any bakery and buy whatever I want. Your exemplary lifestyle is impressive and I am still inspired by the way you approach each day, consume healthy foods and exercise. One should never anticipate the outcome of an immersion course with you. The week spent with Raymonde was just incredible! Every morning, Raymonde gave me French lessons that suited me well. I wasn’t new to French but I really lack the confidence in it. Raymonde not only highly encouraged me but also inspired me to fall in love with this beautiful language without fear. One week was short but Raymonde made French no longer scary and difficult to me. 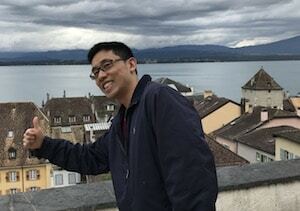 In the afternoon, we went out and explore the city of Nyon and Geneva. 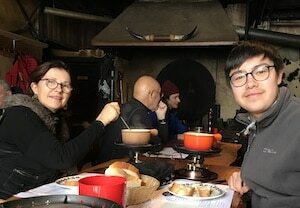 The castles, the old buildings and the beautiful lake of Geneva were just too good to be seen, and enjoying traditional Swiss specialties, cheese fondue and the raclette made the trip even better. What a difference from Taipei! Raymonde is definitely the best hostess one can ever find in Switzerland. With her highly professional teaching skills and abundant experiences, she is able to make one learn French easily and naturally. Her cooking is very enjoyable and healthy and she gives you suggestions that suited one’s preferences to explore the best of Geneva. ‘Ca vaut la peine!’ It’s a french saying that I learnt at Raymonde’s place which means it’s is really worth it and this very well describes how I feel about this immersion! I started self studies in French 9mths ago and studied 3mths in AF Malaysia hence I had some basic but i couldn’t progress much as I lacked confidence in speaking French to strangers. With this immersion I managed to progress to have conversation slowly in French and also talk to strangers at the shop and finding my way around. Switzerland is a perfect place for beginners like me, as everyone speaks at a slow and precise pace. 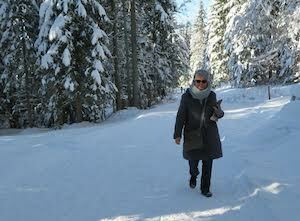 I was welcome by Raymonde together with the snow! She is very charming and humble. I felt close to her immediately. She was so excited to show me around the snow, we went straight to the mountain to have a hot chocolate! I met Michel who just finished skiing there, we had a little get to know each other session everything happened so naturally and they made me feel comfortable immediately! I was lucky as the day I arrived there was an important local festival called ‘L’escalade’ , where people dress up with costume in the 1600’s. Michel took me to Geneva to experience the culture. It was incredible to see the medieval town like in the movies. It’s a true homestay as Raymonde had some of her neighbors over for dinner, her neighbors too were very nice as well, they were all trying to make efforts to speak to me in French. The next day we had her sons that came home for dinner, we went for groceries shopping together and prepared a signature dish from my country ‘Satay’ and we had night of random chitchat all in French. Usually we would have 3 hours in the morning after breakfast to run through grammars and workbook, but as she very soon realized that I’m not much of literature and work book type of person, she quickly adapted to focus more on conversation. She will observe and take note on where I need to improve. For instance I always get mixed up with some English / French words ‘Les Faux Amis’ , she quickly copied a list for me to look through and explained the words with humorous example so that I can remember them properly. On top of the great atmosphere at her home, we also went on some excursions. One day, we went to Montreux and Vevey for sightseeing and the next day we went for a very nice snowy hike to St.Cergue. We had an extremely delicious cheese fondue pairing with some white wines. Overall, this immersion “Chez Raymonde” really exceeded my expectations, I got to know her and her beautiful family better during my short 7 days stay and made a friend for life with Raymonde. I will definitely make a trip back to her place again. Merci beaucoup Raymonde pour votre accueil chaleureux! I spent a most enjoyable week with Raymonde and her family in late November to early December. Raymonde was the perfect hostess, warm and welcoming and considerate of all my needs. She was also a very good teacher, concentrating on listening skills and speaking activities which addressed my greatest needs. It was a great experience just chatting with Raymonde in French. She spoke very clearly, articulating words carefully as I had difficulty hearing and understanding spoken French. I was disappointed that the weather during my stay was not fine enough for excursions on the lake, but I was very lucky to experience the first snow for the season in Gingins. It was thrilling to watch the soft flakes falling to the earth and Raymonde and I enjoyed many pleasant walks through the snow covered village and it’s surrounds. We also had an excursion up into the mountains where we walked through the snow once again. Raymonde also took me to two different Christmas markets and to a concert in a quaint little village church, where we listened to haunting melodies played on the panflute accompanied by guitar and vocals. We ate delicious meals every day as Raymonde is an excellent cook. She was very accommodating to my dietary needs – although I didn’t stay strictly on my diet as there were too many tempting goodies on offer! The whole experience was very memorable and I’m sure my French speaking did improve, but I’m sure it would have improved even more if I had been able to stay longer. I had an excellent learning experience during my week with the vivacious and charming Raymonde. As a student at the B1 level, I wanted just to consolidate my knowledge of French and to become more confident with speaking. And that’s exactly what happened. 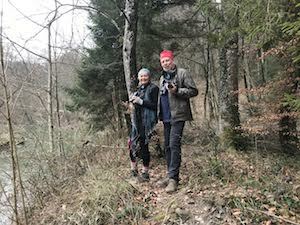 Each morning, Raymonde and I chatted in French over breakfast and then took an hour’s walk through the fields and villages in the beautiful foothills of the Jura mountains. After that, it was two hours of structured lessons, based on the areas that she identified as needing to be enhanced. We used a variety of interesting and contemporary texts. We conversed again over lunch and then I was free to go exploring during the afternoons. 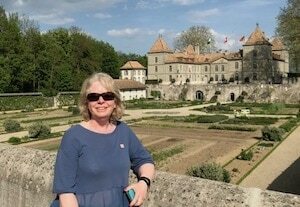 I enjoyed catching the local buses into Nyon and Prangins, visiting the museums in the chateaux, and walking along the banks of Lake Leman. Each evening we chatted again over dinner. In all, I spoke for around six or seven hours a day and I felt that my comprehension and spoken French improved enormously. 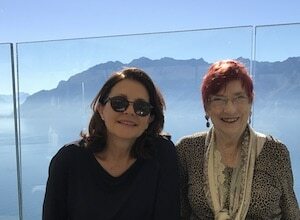 My last day with Raymonde was probably the highlight because we took a trip together to the stunning town of Montreaux and then to Gruyères (yes, that’s where the cheese comes from) where I wandered about the medieval hillside town and enjoyed amazing views. That evening, Raymonde laid on a little dinner party when I was stunned to discover that not only could I understand most of the conversation but I could also participate. Quel succès! Raymonde is a most delightful, interesting person and an encouraging teacher. Her accommodation is spacious, clean and comfortable. In all, my week was not only a success but also really good fun; it was a most memorable cultural, scenic and linguistic experience. We were so fortunate to spend two weeks in French speaking Switzerland with Raymonde in her wonderful home. As we are both at quite different levels with our French, Raymonde was able to construct our lessons so that separately we could achieve our maximum potential in speaking, listening and grammar. Raymonde skilfully challenged and gently pushed us to improve our French language skills to reach the next level. The accomodation in her home was immaculate, every comfort thoughtfully attended to. Raymonde is a fantastic cook and all our meals were healthy and delicious. We had many wonderful day trips with Raymonde; to Le Lavaux, Lausanne, Nyon and to the mountains above Gingins to see Mont Blanc. We went for wonderful walks through the Swiss country side, and yes!, Swiss cows really do wear cow bells. It was so charming listening to the cow bells chiming from our room at night. We felt very much a part of the family and this gave us many opportunities to practise our Frenh conversation. 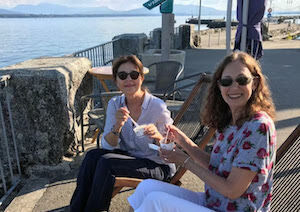 Raymonde took us to see a French language film ” Doctor Knock” in the town of Nyon; this was certainly challenging, however a terrific opportunity to improve our listening skills. All in all a fantastic two weeks with Raymonde and her family. We cannot recommend highly enough Raymond’s French language immersion program. My french immersion with Raymonde in Switzerland was beyond all my expectations. It was exactly what I was looking for to improve my French. Raymonde made me feel part of her family and life from the moment we met. Our structured lessons every morning covered all four criteria of the language – reading,writing, listening and speaking. She quickly ascertained what we needed to focus on for me to sit the A2 DELF exam. Raymonde adapted her cuisine to suit my vegetarian diet. In fact , I ate some great meals and of course enjoyed the Swiss cheeses very much. During my stay it coincided with my birthday. Raymonde went all out to spoil me. Her surprise excursion to Montreux, Lavaux and Chateaux de Chillion was unbelievable. I would highly recommend a french immersion in Switzerland with Raymonde. I wish I had stayed longer as my conversational french really improved. I hope to return again very soon. Raymonde is an excellent teacher, patient and persistent. She encouraged me and gave me confidence. I felt I made great progress and am now more fluent in speech and have better comprehension. She was a gracious host, welcoming and considerate. She provided expeditions and enabled me to make excursions on my own. Her home is attractive and comfortable, complete with cows in the meadow next door. Overall I thoroughly enjoyed the visit, learnt a lot and was charmed by Raymonde. 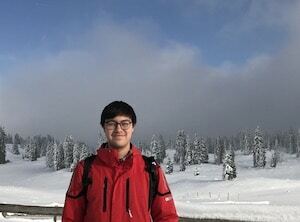 My immersion in Switzerland was amazing ! Raymonde is a wonderful teacher. She is easily capable of detecting what needs improvement and is very enthusiastic about teaching. We focused on oral comprehension and speaking – we addressed several aspects of the Swiss and French cultures – but, in the end, we ended talking about all sort of things. I really feel I’ve learned a lot during this week and I also loved her cooking ! Raymonde is a great guide. She showed me some of the most beautiful sights of French speaking Switzerland. We are a couple of a certain age, both studying French and now at an intermediate level. We greatly enjoyed our immersion course with Raymonde for 2 weeks in late August 2017. It fully met our hopes and expectations. Raymonde is an excellent teacher and a lovely person. 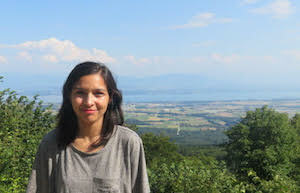 She facilitated the improvement of our French, both in the formal course hours and throughout the days, be it over breakfast, lunch or dinner, or on excursions and hikes in the Jura mountains. The course was very flexible and Raymonde adapted it to suit our needs and interests. Our room was comfortable with a private bathroom. We shared the kitchen, living room and terrace as residents of the house. We often cooked our own dinners and shared them with Raymonde and her partner Michel. We can warmly recommend the immersion course with Raymonde, particularly for student of intermediate level. In September 2017, I spent one week with Raymonde and it was a wonderful experience! It had been many years since I had studied French, but Raymonde made me feel comfortable from the very beginning. She is very generous with her time, patience, and hospitality and I benefited immensely. The town of Gingins and the surrounding areas are absolutely gorgeous. Raymonde provided me with many interesting excursions and opportunities to practice French, not to mention many delicious meals! I had so much fun spending time with Raymonde’s friends and family. It was a trip I will never forget and a great jump start to my French language learning. I definitely recommend an immersion stay with Raymonde, but suggest staying at least 10 days as one week went by entirely too quickly! 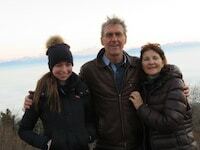 I thoroughly enjoyed my stay with Raymonde and her family in Nyon, Switzerland. Her home is located in Gingins which is surrounded by beautiful countryside; making it perfect for evening walks or runs. The ensuite room was very comfortable and all amenities such as WiFi were provided. Meals were very tasty, healthy and filling. Residing in Nyon throughout my vacation gave me plenty of opportunity to practice my French and allowed me to attend local events such as the Swiss national day celebrations; thus providing a unique immersive Swiss cultural experience. The regular private French tuition was excellent and consisted of lessons in grammar, comprehension and vocabulary. I really wanted to write and say what a fantastic week I had. My goal had been to push my base level up to B2 and I’m really confident with the things I’ve learnt through Raymonde I am almost there. She was an expert teacher, patient, experienced and insightful and living with her was a real privilege. I spoke nothing but French for six days and my confidence skyrocketed under her support. I really cannot rate my trip with her highly enough and it’s left me very inspired to keep going on my journey to fluency – which genuinely feels a lot more achievable since my time with Raymonde and her family. I will definitely be booking another stay with her in 2018 – if she has space! From the moment my reservation was confirmed, Raymonde made me feel welcome. She took the time to get to know me, my goals for learning French and my other interests. As a result, I saw unique museums, toured medieval towns and learned French each day. This was my first visit to Switzerland and she helped me to see the beauty and to feel the ambiance of the country. Her family was welcoming as well and we had many engaging conversations. 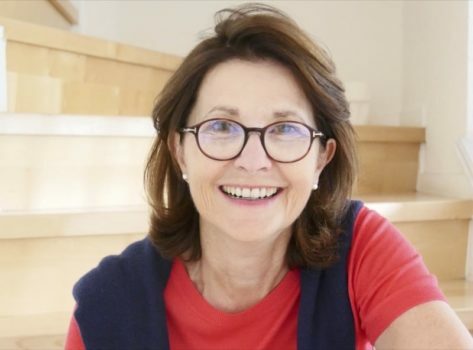 As she said in her description: My aim is to give you encouragement, support and help to gain an excellent understanding of the French language, allowing you to have the confidence to engage in conversation in the relaxed, peaceful, surroundings of my home.” She does that and more! I definitely want to return and for 10 days next time. 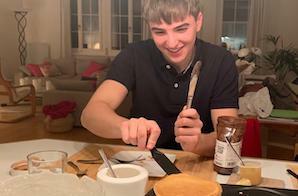 In July 2017, my husband and I took our ten-year-old son Nicholas to Raymonde’s house in the French speaking part of Switzerland to learn French. We had an AMAZING time!!! 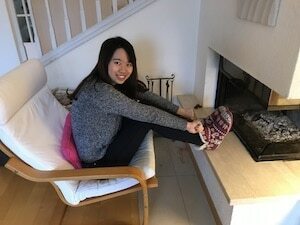 We stayed in Raymonde’s spacious and comfortable home for a week in Gingins (near Nyon), which is conveniently located 15 minutes from Geneva’s city center by train. 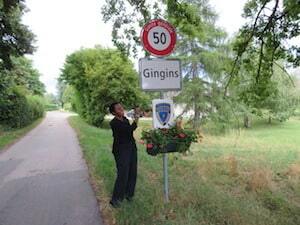 The Swiss village of Gingins is peaceful, relaxing and safe. Raymonde is kind, friendly, loving, and gracious so my family thoroughly enjoyed our stay in her home. In the mornings, our son Nicholas took a 3-hour French lesson daily with Raymonde. He read books and passages, wrote sentences, made conversations, and engaged in an assortment of listening activities with Raymonde. As an experienced French teacher, Raymonde was able to identify my son’s language needs and gave him activities and practices on concepts he needed to further develop his French skills. Raymonde also guided Nicholas to keep a journal of new French vocabulary or sentences he came across in the activities or conversations so he can expand his vocabulary during his stay. Raymonde encouraged Nicholas to speak French as much as possible in a supportive and relaxed environment. At mealtimes, Raymonde invited Nicholas to cook a variety of dishes with her as she continued speaking French to him. 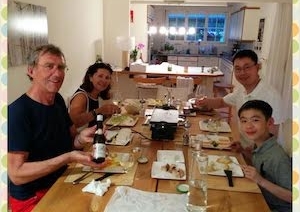 My family enjoyed the delicious meals Raymonde has prepared for us…from Swiss raclette (melted cheese) with potatoes, to traditional rosti, to BBQ lamb & chicken skewers, baked wild salmon fillets, prawns with rice, and homemade waffles with fresh fruits. All the scrumptious dishes were prepared with fresh, local ingredients! Yummy! 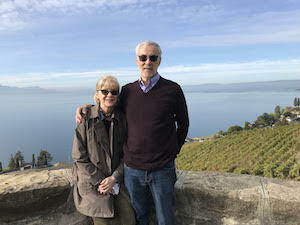 In the afternoons, we had fabulous excursions to gorgeous towns and cities such as Gruyère, Geneva, Montreux, and Nyon with Raymonde and her partner Michel. 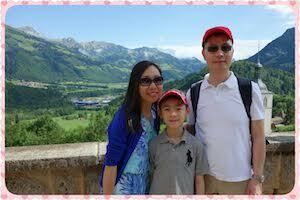 Michel is super fun to be with and my son adored spending time with him on our day trips and during meal times. Michel spoke solely in French to us so it gave us a lot of practices in the language. During our stay, my family even got to visit the beautiful medieval town in Yvoire and the tree-top adventure playground in Divonne-les-Bains in France as Gingins is only 25 minutes away by boat or by car to the French border. Overall, we are grateful for the wonderful stay with Raymonde and Michel. We enjoyed the French lessons, the sight-seeings, the delicious local delicacies, and the warm friendship! We felt like visiting a close friend in Switzerland! My family already told Raymonde that we will return to her French program in the very near future. We highly recommend Raymonde’s home-immersion program to anyone who would like to learn French and experience the Swiss culture. Merci beaucoup, Raymonde et Michel! We had a truly enjoyable and memorable time with you! We will return! Ce juillet, je suis allé chez Raymonde pour des leçons de français à Gingins en Suisse. Là, j’ai appris beaucoup de français fantastique. J’ai vécu dans une grande maison confortable, reçu des leçons de français pour trois heures par jour, aidé dans la cuisine avec Raymonde, et j’ai vu beaucoup de beaux monuments dans l’après midi. Raymonde est très gentille. Ma nourriture préférée dans la maison de Raymonde était les rösti et la raclette. Je suis allé à Gruyère, Montreux, Genève, Divonne-les-Bains et Nyon avec Raymonde, Michel et mes parents. J’ai beaucoup aimé mon séjour chez Raymonde. L’air était frais, la nourriture était délicieuse, tout le monde était gentil, et la Suisse est un très beau pays. My husband and I are complete beginners in French, and by that I mean we had used Duolingo and a few other apps to work on some of the very basics. We pretty much had zero experience actually speaking French. 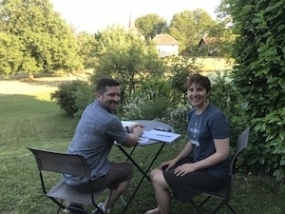 I was nervous about it, but we signed up with Raymonde for a one week immersion program to kick off our 3 week vacation in Switzerland and France. I didn’t know what to expect, but she immediately put my mind at ease upon meeting her. Raymonde has a lot of experience teaching students of all levels and is so skilled at assessing what a student needs to focus time on and what will make a student feel more comfortable and confident. She has a fabulous sense of humour and is extremely patient and kind, all valuable attributes in an instructor. Everyday, we had 3-4 hours of instruction, each lesson had a theme. We learned how to order at a bakery, make our selections at a restaurant, send a package at the post office, make a trip to the market, buy tickets at the train station, make a reservation at a hotel and more. The week includes an excursion or two to see the sites and give you a chance to practice speaking with her support. I sprained my ankle in Geneva prior to going to Raymonde’s. She went above and beyond to tailor our excursions to include several options shorter than normal in duration with this limitation in mind. We went to a the Barillette restaurant at the top of the Juras near her home. Magnificent view of Lake Geneva and Mont Blanc from there! We went to Nyon for a lovely lunch and off to Lausanne for a tour of the cathedral. My husband was able to take some beautiful bike rides. There is so much to do in the area, and she has many recommendations for what to do for fun. We learned so much from Raymonde and gained a lot of momentum to keep learning. Of course I still struggle to understand many of the questions that are asked of me in French, and I have a very limited vocabulary. But by the end of the week with Raymonde, I was amazed at what I was able to understand! I highly recommend you come and do this immersion course with Raymonde. You will not regret it! My home stay with Raymonde was superb and very personally rewarding. The weather was amazing and the beauty of the local region so stunning, that it was hard not to be highly motivated to make the most of my time in her “little corner of paradise”. 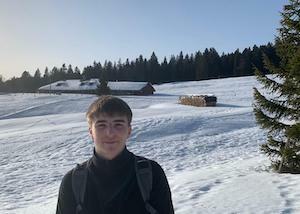 Having felt my motivation towards achieving language proficiency had taken a dive recently, I was keen to experience a 1:1 intensive language experience during my week in Switzerland. My correspondence with Raymonde prior to my arrival had already laid the groundwork for a relaxed initial meeting, not to mention a delicious apple tart once we reached her lovely house. Raymonde is a delightful person with many interests and a great sense of humour who somehow manages to fit everything in and make it all work. A morning schedule of lessons was quickly established after some amazing “petit-dejeuners”, with Raymonde soon zoning in on my weaker areas, but also challenging me towards my next level of proficiency (B2). She is very skilled at highlighting the tiny errors that become habitual and that are often not corrected when you speak to others, but for the sake of progressing and becoming more eloquent are very important to eliminate. A variety of teaching methods was utilised and I soon found my confidence to speak on all manner of subjects was increasing daily as my errors diminished. Mealtimes were not only a delight as Raymonde is a very creative cook of deliciously healthy food, but we could touch on many interests that we had in common and I met nearly all of her immediate family who made me feel most welcome. Free time to explore the many beautiful nearby towns such as Nyon & Lausanne with their mediaeval history was beneficial as were the lunches and excursions to Morges for the Hubert de Givenchy exhibition of clothing he designed for Audrey Hepburn. My week went too quickly, but I am already working on a return visit and for a longer period next year and highly recommend Raymonde and her homestay immersion course to anyone wishing to make true progress. Thank you so much Raymonde! I had quite an enjoyable time, albeit short, during my immersion lesson with Raymonde. Although I had booked only one week, Raymonde’s instruction exceeded my expectations. Her method of teaching helped expand my rather limited vocabulary. Whenever I had difficulty finding the right words, she would suggest another way to phrase a sentence. I’d forgotten much of my two-year beginner’s lessons from over twelve years ago, so the written and oral exercises were a great way to remember what I had learned from school, particularly the use of pronouns, past tenses, and indefinite articles. I liked that, for the excursions, she would always give at least two options and let me choose where we will go and what we will do. As part of the immersion, one is encouraged to venture on one’s own, so I went to the nearest mall and to Geneva all by myself, taking the bus and train, and communicate en français. I very much appreciated being included in her meeting with her sister and nephews for dinner as well as visiting her mother. It was wonderful to see and hear the family interact with each other – of course it’s one of the best method of immersion. Merci beaucoup, Raymonde. Je reviendrai! I spent 2 weeks with Raymonde in May 2017. She is a remarkable teacher, as well as a gracious hostess. Her home is lovely, and my room was large and comfortable. Raymonde is also an excellent cook. She was more than willing to show me how she cooks and what she uses, so that I could bring some of the ideas home with me. The area where she lives is beautiful, and many afternoons we ventured out to visit the towns nearby. But the most important thing is that my French proficiency increased considerably in the 2 weeks that I was there. I could not recommend her more highly, as a teacher and as a friend. hope to return one day and work with her again. My daughter Nadine, 14, has never been particularly keen on studying. Spending one week of her “well-deserved” holidays “doing French” was not really her idea of fun, even less so since her friends went to a sports camp. But because she needs to pass an important exam, she agreed to an immersion stay with Raymonde. When after a week of family holidays in Provence our two men were about to drop us off at Raymonde’s, we were all warmly welcomed and treated to a delicious apple tart. That was an excellent start and we became friends immediately. This was very important, since studying with someone you like is easier and more enjoyable. Nadine liked her French lessons with Raymonde so much, that she did not want to split them with me, as she had intended. With Raymonde’s help she has made up a good part of what she had missed at school and now feels more at ease when using French. I, on the other hand, had hoped that with one lesson of French per day I might reactivate a bit of my long forgotten vocabulary and structures. My hopes were exceeded – and that without even taking lessons. Raymonde spent so much time talking to us and making us speak that even I got a lot of practice. And she was quick to correct – often with explanations – when we made mistakes. Before she started her lessons with Nadine in the morning, she gave me a grammar book and told me which chapters I needed to revise. So now I feel quite comfortable speaking French again. On our way home, Nadine said that she had really enjoyed this girls’ holiday and that we should do this more often. Thank you, Raymonde, for making studying feel like holidays! On y va. Let’s go. Let’s go shopping. Let’s prepare lunch. Let’s take a walk. Let’s speak French. 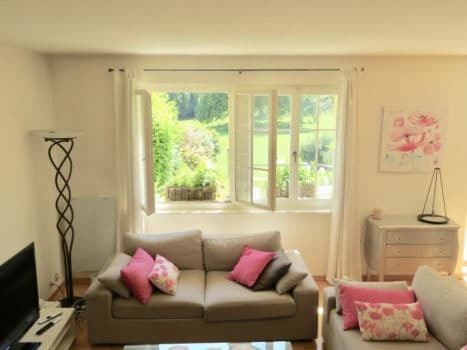 We wanted to dive into French and their first chance came with our booking for two weeks with Raymonde at her place in the country outside of Geneva just at the time the tulips came out and the fields had turned a rich yellow from the colza. Raymonde, remarkable in many ways, is a teacher first and foremost. She is a thoroughly conscientious professional, easily adaptable to various learning styles. We know firsthand, as each approaches the challenge of acquiring French differently. Raymonde’s pride and skill in her work comes through with each individualized session. Raymonde is patient and has a great sense of humor. We tested her patience while sharing many laughs together. At the end of their stay, we were disappointed our time with Raymonde had ended so quickly. On y reviendra ! We will come again!! Raymonde is very good at fitting in everything to make a visit to her home memorable and worthwhile. I benefited from the immediate feedback she gave me during our conversations which were almost entirely in French. If I spoke in error, I was corrected right then. Soon I made fewer errors. In our conversations, I learned a great deal about life in French speaking Switzerland. Getting out in the countryside was also a big benefit, and Raymonde made sure I had every opportunity to see the places, both natural and manmade in the area. Luckily it was a gorgeous week weather-wise. I believe a successful immersion experience, after the enthusiasm of the student, requires a skilled teacher focused on the individual needs of the student and a warm, welcoming environment that encourages practicing what is learned. Based on those criteria, my week with Raymonde was highly successful. She responded immediately to my initial request, and I was quickly able to book a time in beautiful Gingins. I was warmly welcome and shown to the lovely room with attached bathroom. We started discussing the areas I felt had highest priority, and as the week progressed Raymonde also made numerous helpful suggestions of topics for focus or additional work. Her interest in people and good humor made both the formal instruction as well as the discussion during the excellent meals comfortable and fun. In addition to formal rules of grammar, Raymonde was also quick to point out how people speak “in real life”. The excursion opportunities were numerous, and I chose to visit Geneva’s old town as well as a lovely local museum. I am very pleased with my decision to go to Gingins and feel I exceeded my goals for the immersion. Before my visit with Raymonde, I completed the A1 basic learning of french. After learning the basics in French, it was recommended to me to live in a french environment. I then discovered french today, and I thought I would pick Switzerland to see the beautiful scenery. Switzerland is truly under rated, and is a must see place for sure ! During my two week stay I was able to bring my french to the next level. Raymonde was a marvelous teacher and not only did she save me time and money by attending classes in a language school for weeks upon end but I also got to see Switzerland and have my own private tour of the country. It was so significant to experience language learning from actually living it. It was a pleasure to meet and stay with Raymonde, it was like living in a fairy tale for two weeks. The village that Raymonde resides in is sincerely tranquil, if you are looking to get out of the huzzle and buzzle of your busy life then this is the place for you. With only being minutes away from Nyon, and two train stations that take you anywhere, it truly was a paradise. Raymonde has encouraged me to continue with my french studies as she has made it so much easier to understand the structure of the french language. Now it is time for practice, practice, practice ! 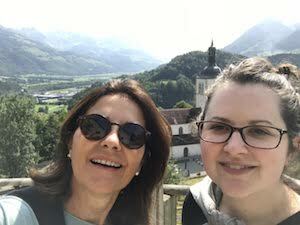 My daughter Sarah, who is 18 years old, spent a very enjoyable week with Raymonde and her family in Switzerland. 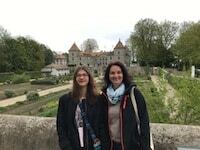 Raymonde spent three hours each morning tutoring Sarah and helping her to improve her oral and written French for her Leaving Cert exams in June 2017. Sarah enjoyed the relaxed and warm atmosphere chez Raymonde and was made to feel a part of her family from her arrival. Her bedroom was comfortable, warm and spacious. They visited Geneva, Lausanne and took several hiking and cycling trips together. This was very much to the appeal of Sarah who is a fitness fanatic. Raymonde prepared many wonderful, healthy meals for Sarah and included her in sharing meals at home and while they went on their many excursions. It is a holiday that Sarah will never forget. Thank you to French Today for recommending Raymonde to us. It has been a most wonderful experience to learn the language in a warm and charming place. The village of Gingins, located at the heart of the la Côte, offers an authentic Swiss atmosphere with a beautiful view on the Mont-Blanc. I was warmly welcomed and immediately felt at home. My room was spacious, had its own bathroom and was tastefully furnished. Furthermore, I could benefit of all the amenities of the house. My days were filled with great activities in the generous surrounding nature and often ended with lovely talks around the chimney with a cup of tea. Raymonde is a skilled and passionate teacher who is supportive, patient and has a great understanding for people. She taught me a living language by going to cultural place and shopping in nearby organic market, among others. 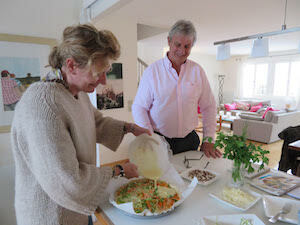 We then spent time cooking French dishes together, such as her famous “tarte tatin”. Since, I use the French language on a daily basis in my working environment and often get reminded of her teachings that helped me a lot to become fluent. I highly recommend her to any person who would like to learn or improve a Language.